2019 NCR M4 One Shot. Picture credits - NCR. Submit more pictures. 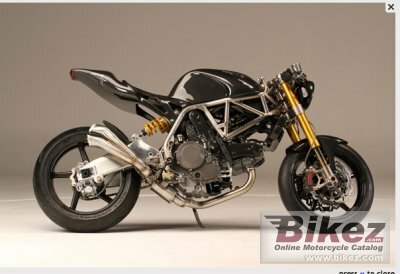 The NCR M4 One Shot comes with a NCR 1200, modified Ducati EVO 1100 engine complete with billet stroker crank, titanium connecting rods, high compressed 102mm pistons, titanium hardware throughout and NCR-EVR slipper clutch. The NCR M4 One Shot produces 132 hp at 8,700 rpm, torque of 105 ft-lbs of torque (143 Nm) and a weight of 278 lbs (126 kg). Color options: Black. Custom paint available on request. Ask questions Join the 19 NCR M4 One Shot discussion group or the general NCR discussion group. Enter your e-mail to join the 2019 NCR M4 One Shot forum and get notification of answers and new messages about this bike. You can unsubscribe with a single click. Bikez does not display, sell	or misuse e-mail addresses. Bikez.biz has an efficient motorcycle classifieds. Ads are free. Click here to sell a used 2019 NCR M4 One Shot or advertise any other MC for sale. You can list all 2019 NCR M4 One Shot available and also sign up for e-mail notification when such bikes are advertised in the future. Bikez has a high number of users looking for used bikes. Before you buy this bike, you should view the list of related motorbikes Compare technical specs. Look at photos. And check out the rating of the bike's engine performance, repair costs, etc.